I have a 1220c that is several years old but unused and still in its box. I've put new cartridges in and downloaded latest drivers but can't get the paper to feed. Orange resume button light keeps flashing. any ideas? Thanks. The on /off button (green) when pressed will not stay lit. Any ideas? 5.If the Print Cartridge light is still blinking, push down firmly on the center of the Access Cover (the extra pressure may engage the sensor). If the Print Cartridge light quits blinking, remove the pressure from the Access Cover to see if the Print Cartridge light starts blinking again. Re-apply the pressure to the center of the Access Cover to see if the Print Cartridge light stops blinking again. I have an HP1220C that has a paper feed problem. Paper will not feed from either of the front trays but is ok using the rear feed, and I have discovered that the input tray assembly is not lifting so cannot feed paper to the rollers. I've got as far as taking the input tray assembly out and now I can see the up and down movement is controlled by a spring inside the input tray and a cam on the roller shaft above it. (This shaft is the one with the rubber 'D' roller on it). My question is what makes that shaft start turning in the first place? There are gears on the left side that will drive it when it is moved to the correct place, but at its rest position it seems to need something else to start it turning, and then its gear can mesh with the driving gear above it. I hope that all makes sense. Any help, info or advice will be greatly appreciated. My HP Deskject 1220C shows the resume button light is on (not blicking) and I can not print anything. My hp deskjet 1220c will not print in black. I have changed both black and colour cartriges with genuine hp new ones and still the bklack does not print? Please can you advise. hp deskjet 1220c(my printer after any print print a extra test page)!!!!! Problem: I have a 1220c that is several years old but unused and still in its box. I've put new cartridges in and downloaded latest drivers but can't get the paper to feed. Orange resume button light keeps flashing. any ideas? Thanks. Solution 1: I know this is going to sound stupid, but bear with me. Is the paper in the right place? I have a HP1220c which I had not used for several years, and when I got it out of storage it wasn't picking the paper up. But (even though I had used this printer a lot in the past) I had put the paper in the wrong place. Bottom 'tray' is the input tray, and the paper nesd to be up against the right hand side. I put it in to the left. Once in the correct 0place, it picked up the paper without any probems. I had lots of new, seale, but out of dat cartridges, all of which refused to wornk, but that's another problem - but often VERY to fix. All problems on this page have been submitted and answered by users. 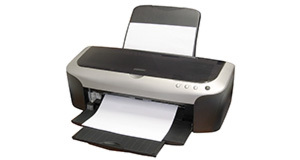 If you have a problem with the HP Deskjet 1220C, please submit it below and we'll post it here. Problem: The on /off button (green) when pressed will not stay lit. Any ideas? Problem: 5.If the Print Cartridge light is still blinking, push down firmly on the center of the Access Cover (the extra pressure may engage the sensor). If the Print Cartridge light quits blinking, remove the pressure from the Access Cover to see if the Print Cartridge light starts blinking again. Re-apply the pressure to the center of the Access Cover to see if the Print Cartridge light stops blinking again. Problem: I have an HP1220C that has a paper feed problem. Paper will not feed from either of the front trays but is ok using the rear feed, and I have discovered that the input tray assembly is not lifting so cannot feed paper to the rollers. I've got as far as taking the input tray assembly out and now I can see the up and down movement is controlled by a spring inside the input tray and a cam on the roller shaft above it. (This shaft is the one with the rubber 'D' roller on it). My question is what makes that shaft start turning in the first place? There are gears on the left side that will drive it when it is moved to the correct place, but at its rest position it seems to need something else to start it turning, and then its gear can mesh with the driving gear above it. I hope that all makes sense. Any help, info or advice will be greatly appreciated. Problem: My HP Deskject 1220C shows the resume button light is on (not blicking) and I can not print anything. Problem: My hp deskjet 1220c will not print in black. I have changed both black and colour cartriges with genuine hp new ones and still the bklack does not print? Please can you advise. Problem: hp deskjet 1220c(my printer after any print print a extra test page)!!!! !